A few months ago, a piece of A4 paper appeared on the door of a defunct sushi place just up the road from me, by Bastille. It said 'Coming soon: vegetarian restaurant'. Then began several weeks of anticipation and building works, before Végé'Saveurs opened this summer. The menu is basically a carbon copy of the Asian vegetarian delights at excellent Paris spots Tien Hiang and VégéBowl. That's fine by me! 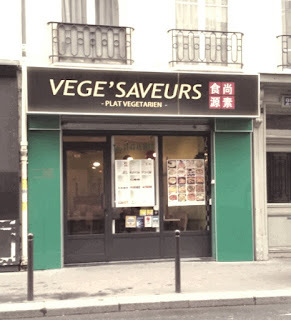 There's always a little confusion about what is and what isn't vegan at this little family of Paris vegetarian restaurants. Once at Tien Hiang, they told me that everything was vegan apart from the 'ham' and the one claypot that contains cheese. 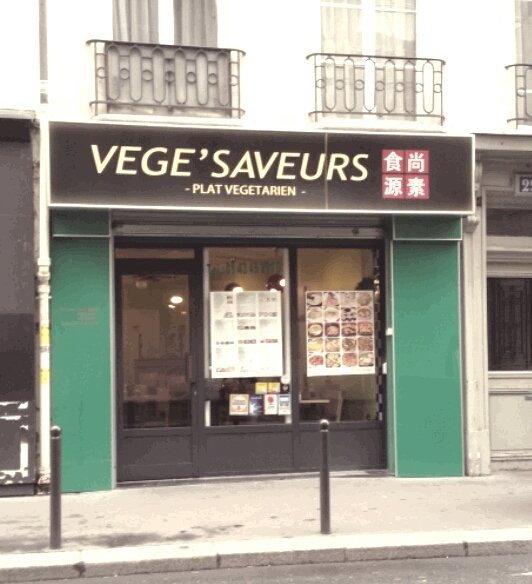 At Végé'Saveurs, they've told me that everything is vegan apart from the 'chicken' and 'beef', which contain small amounts of milk. To be safe, you can order tofu and vegetable-based dishes. Which are delicious. Like the green papaya salad, for example. Here it is having been taken away to my house. There's no price reduction for take-aways, but the dishes are pretty inexpensive anyway. Sadly, I don't find the food at Végé'Saveurs as good as it is at Tien Hiang. In theory the dishes are the same, but they certainly don't taste identical. 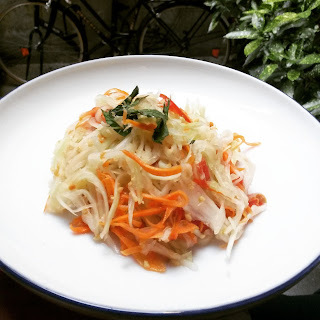 The papaya salad is a little bland (I had to perk this up with more lime, soy and hot sauce). And some of the sautéed dishes I've tried are too greasy. I'm hoping that it's just teething problems. I might even be super brave one day and mention the little flaws in the food. But if the veggie Asian place five minutes' walk from my house was perfect, I'd end up having to be winched out of my flat by the fire brigade. So maybe it's for the best.